Points : 3.5 out of 5. After finishing her studies at the conservatory in 2002, the guitarist Eveline van Kampen wishes to form a group in order to play the music that she has in her head. She then calls to Peter H. Boer, bass player of S.O.T.E. (Songs of the Exile), who will also take care of the production. On vocals, she asks Esther Ladiges that studied at the same conservatory and already participated in some projects of which Ixion, Entropy and Ayreon. For drums it is Emile Boellaard that holds office. He also comes from S.O.T.E.. And finally, for the keyboards Eveline again places acall to a woman, Eveline Simons. This last one regularly participated in projects of musicals. She quits the group towards the end of the recordings of the album to be replaced by Annemieke of Boer, who only plays on a single tune. 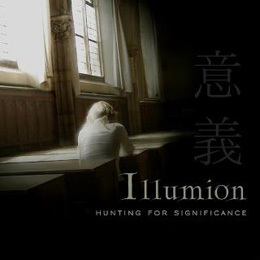 The music of Illumion can be classified as progressive metal. The tones are often heavy, by the guitar of Eveline, and sometimes symphonic arrangements. The vocals are light, it flies over the group deluding us with appealing melodies of melancholic tones. The guitar is incisive, the powerful rhythm section, the keyboards serve as glue. The texts are inspired by authors such Oscar Wilde, Edgar Allan Poe, Frank Kafka and William Blake. The booklet, by Jankees Braam (leader of Ixion), is a success. Every text is accompanied by a picture drawing us into the subject. Among the influences of this first opus of Illumion, you find Magenta, The Gathering, Ayreon and Stream of Passion. The group is nevertheless lighter than Stream of Passion and Ayreon. The heavy tones are less predominant. It is for that, but also for the voice, that Magenta is a good example. Titles like "Into the labyrinth" and "Metamorphosis" enthrall us. The scheming and stretched mood mixes itself wonderful to light and varied arrangements. The guitar takes out some small soli to send thrills along your spiner. The voice of Esther reveals all its possibilities on "Infinity", a title bathed in the violin of Irma Vos. "Whirlwind" will make us turn our head. This first opus of Illumion is very successful. The lovers of progressive metal with feminine voices will be delighted to discover these newcomers on the Dutch musical scene.